After seven exciting years of CESCG we are again happy to introduce a lot of very interesting student work (24 papers!) presented at CESCG 2004 in Budmerice, Slovakia, in April 2004. 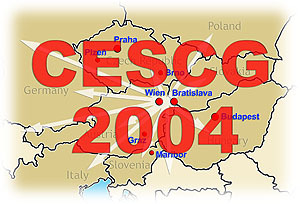 After the brilliant organization of CESCG 2003 by Thomas Theußl (and others), we knew that it would be a hard job to organize CESCG 2004 on an acceptable level. However, the introduction of new features to CESCG such as the integration of color plates within the proceedings, for example, make us hope that CESCG attendees again will be satisfied with this student conference. Also, a larger team was set up to make sure that we would keep up the high quality of this Central European Seminar on Computer Graphics. So who are the CESCG heroes that made things happen this year? At first Helwig Hauser is named, also called the mother of CESCG. Helwig was involved in every single job, always helping with valuable remarks and suggestions. We also thank other helping hands from Vienna, especially Andreas Traxler for his perfect work in all kinds of jobs, Robert Kosara for the organization of the reviewing process, Helmut Doleisch for keeping the web pages up-to-date, Markus Hadwiger for the CD production, and Michael Knapp for the new logo design. We are very thankful to CESCG organizers from Bratislava, namely Andrej Ferko, also known as the father of CESCG, Stanislav Stanek, and Marek Zimanyi for proceedings and CD production, and the excellent on-site organization. The main idea of CESCG is to bring students of computer graphics together across boundaries of universities and countries. Therefore we are proud to state that we have achieved a record number of 15 participating institutions and a conference program consisting of 24 valuable student works and two invited talks. We are also proud that for the first time students from Szeged, Hungary; Szeczin, Poland; Hagenberg, Austria; Bristol, United Kingdom; and Sarajevo, Bosnia and Herzegovina contributed to the seminar. We of course also welcome groups from Bratislava, Slovakia (UK and STU); Brno and Prague, Czech Republic; Budapest, Hungary; Maribor, Slovenia; Bonn, Germany; and Graz and Vienna (TU and VRVis), Austria for their repeated contributions. This year, the CESCG seminar is organized in the spirit of Cultural Heritage. Invited talks this year are held by Jirí Zára from the Czech Technical University in Prague, Czech Republic, about ''Web-Based Presentations of Large Urban Scenes'' and Alan Chambers from the University of Bristol, United Kingdom, about ''Recreating the Past: Graphics and Archaeology''. The seminar features an exhibition called ''Virtual Heart of Europe''. The seminar is held under the auspices of the Austrian Ambassador in Slovakia, his Excellency Martin Bolldorf, and is co-organized with the Spring Conference on Computer Graphics (SCCG), which takes place right after the seminar. Caligari Corporation, a company in field of 3D modelling and rendering software.